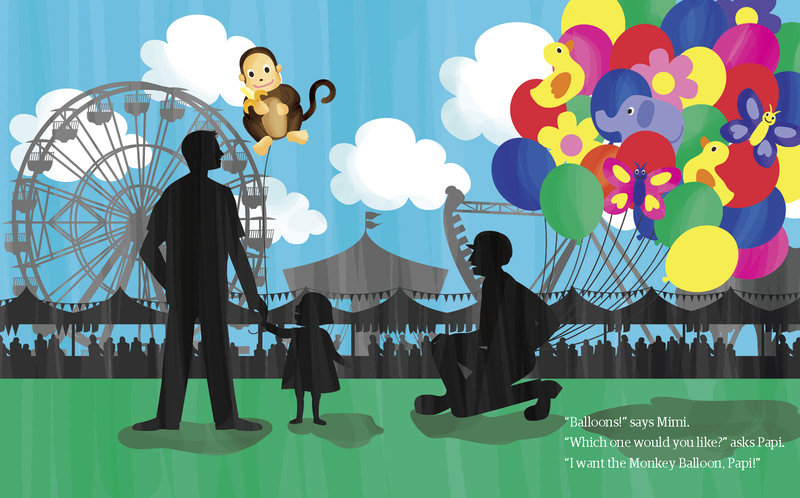 The Monkey Balloon, filled with bright, bold backgrounds and silhouetted people, tells an engaging story about a little girl and her father in search of her lost balloon. Papi gets a beautiful balloon of a monkey holding a banana at the carnival and gives it to his daughter, Mimi. Mimi is devastated when her monkey balloon is carried away by the wind. Her father, Papi, asks her where she thinks her balloon may have gone. Mimi makes suggestions and they search the ice cream shop, playground, a passing bus, and the ocean. Finally they find the monkey balloon at the zoo! All is happy! When Mimi loses her beautiful monkey balloon, her father helps her look for it. From The Monkey Balloon. Images Courtesy Rebecca Eisenberg. The Monkey Balloon website has helpful tips on how parents can encourage children to retell a story. There’s also a great post on language and learning tips. A great article on reference font and increasing literacy skills at Rebecca Eisenberg’s site. Rebecca also has a great list of books with her reviews on her site. She has great reviews of picture books here. This is a fun, simple, and well-told story that engages my one-year-old (specifically 14-month-old) son! 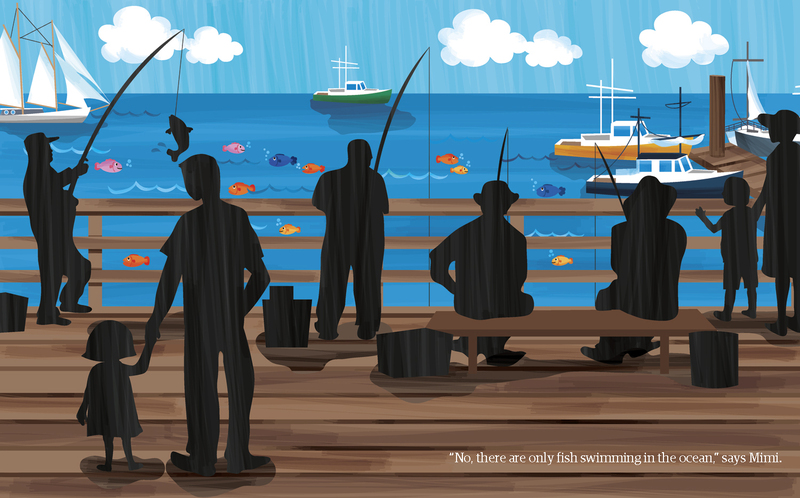 He babbles along as I read it to him and enjoys gazing at the bright illustrations and the black silhouetted people. There’s a great amount of repetition and the clear illustrations make it easy for me to point to specific things while reading the story to him. At the end of the book are two pages filled with language and learning tips for very young children. It gives realistic expectations (without causing unnecessary anxiety) of when you can expect your children to have acquired particular skills such as knowing prepositions and using basic action words. This book also gives helpful suggestions as to what parents can do to encourage language acquisition and visual awareness. It has a happy ending! There’s nothing to fret — Mimi finds her beautiful monkey balloon and all ends well. The silhouetted people remind me a bit of Tana Hoban’s books. My four-year-old son enjoys this book, too! He once had an experience losing his beloved balloon — and he enjoyed reading about Mimi and Papi’s adventure. With my four-year-old son, it was fun asking him to retell this story back to me. I loved hearing what he added, what he glossed over, and what details he found to be the most important. You can tell that this book was developed by child development experts — their focus, use of drama, use of repetition, and happy resolution make this book not only an entertaining read, but also a fun exercise in listening and learning skills. It’s excellently done! [Library] Worldcat.org – Ask your library for it. I’m sharing this post with Perfect Picture Book Fridays over at Susanna Leonard Hill’s fantastic blog! Her website is an incredible resource for picture book reviews and all things children’s books. I’m always impressed with what I find on her site. Please take a moment and check out lots of other picture book reviews. 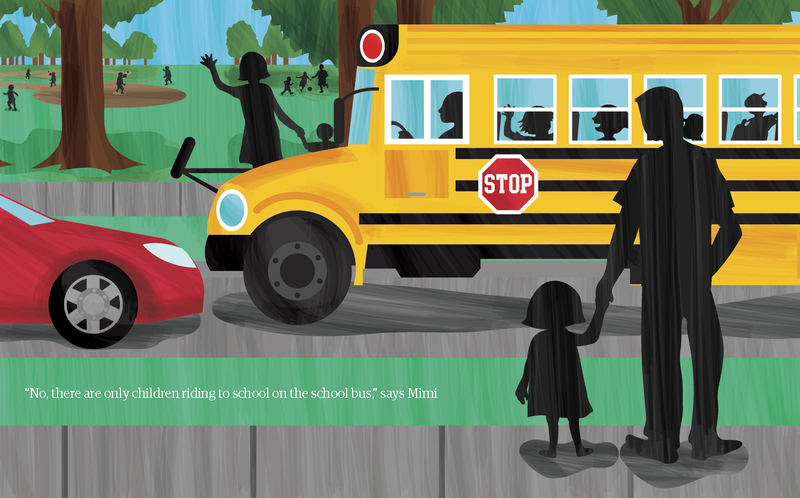 The bright illustrations with black silhouetted people really adds another layer to the story. I haven’t seen any picture books with this kind of color and silhouetted combination. It makes for a stunning read! I like to think about imitating this book with little ones. It is just the sort of thing my kids and I would do. Thanks. Absolutely! My pleasure! It’s fun seeing them imitate the scenes in the book! What interesting illustrations!! Looks like Dad and daughter have a fun day looking for that balloon! What a fun book! That scene on the boardwalk is absolutely stunning! Looks a bright, beautiful story for the very young. The colorful and bold illustrations are really pleasing for kids. What a fun and engaging story for children. Sounds like a wonderful book for my granddaughters who are just learning to read. Thank you for sharing and the great info in why you like it. The silhouettes on the bright colourful illustrations look great. What bright, stunning pictures! This would be an interesting story to add a dance/movement class to! I think my little ones would love it! The style of this looks very unique. Unfortunately, I didn’t find it at my library. 🙂 I’ll add it to my other list.